The River cruise king, Viking, has branched into the Ocean cruise market in recent years. They custom-built 6 luxurious 930-PAX ocean liners a few years ago, with one delivered in 2015, one delivered in 2016, two delivered in 2017, one to be delivered in 2018 and one in 2019. All six ships have identical deck plans and every stateroom is an outside balcony. A very basic shore excursion is included in each port of call, or you may pay extra for an optional excursion. House wine/beer/soda with lunch/dinner services, unlimited free WIFI, thermal spa, self-service Laundromat and dinners at special restaurants are all included. Airfare is extra, but sometimes Viking throws in free air to promote a sailing. Transportation between airport <-> ship is included if you let Viking book your air and do not deviate. Dress code is "casual" during the day and "elegant casual" for all dining venues after 6pm, no "formal nights". Needless to say, the company is targeting the same clientele attracted to other up-market cruise brands like Oceania, but their additional incentives like all-balcony rooms and free excursions give them added value against the competition. After watching many Viking commercials during PBS's run of Downton Abbey, as well as reading glowing online reviews, we wanted to try a Viking Ocean cruise. We found an 11-night Trans-Atlantic crossing on the brand new Viking SUN at a good price. 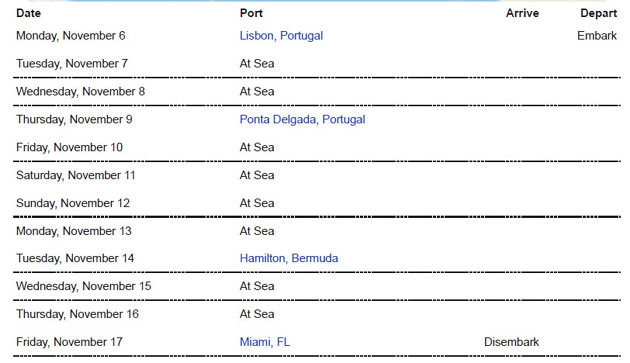 (As a matter of fact, almost all the Trans-Atlantic sailings are at good prices.) We treated this cruise as vacationing in a 5-star floating resort hotel, with dining services, entertainment, enrichment lectures, excursions and transportation all included. For this cruise, the ship was the destination. The brand new Viking SUN started its maiden voyage on October 4th with a 7-night cruise from Venice to Athens. By the time we boarded the ship in Lisbon on November 6th, she was only one-month old. 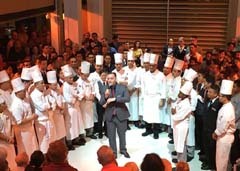 In mid December Viking SUN embarked on a 140-day World Cruise from Miami to London. 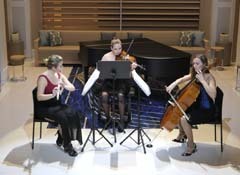 Viking Ocean's home page is at: https://www.vikingcruises.com/oceans. You may click on the "360° Tour" link to see the interiors of one of the ships. 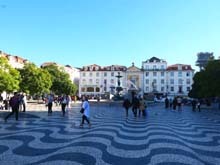 We had been to Lisbon in 2009, and to Bermuda in 2013, therefore the only port that was new to us was the Ponta Delgada of the Sao Miguel Island of the Azores of Portugal. We heard that the Azores felt like New Zealand, although we have not been to New Zealand. Rough seas? Since we would be crossing a big open ocean for several days, MC brought along a pack of over-the-counter "Non-Drowsy Dramamine with Natural Ginger". We did not encounter any rough seas but the ship did sway a bit on two of the sea days due to wind and the Dramamine did help MC to dispel any discomfort. Vincent seemed not to be affected by the ship's movements at all. CRUISE: We knew that if we were to book with an outside travel agent we would receive a few hundred dollars of OBC (On Board Credit), but for several reasons we won't bore you here we decided to book directly with Viking. We paid $2199/pp (after applying a $100 new-customer discount) for a 270-sq-ft Deluxe Veranda. Air fare was included, free of charge from over 150 US cities. AIR: We flew TAP Portugal from Boston -> Lisbon, and then flew AA from Miami -> Boston. If your flight departed too early in the day or had a tight connection, call Viking soon after receiving your air itinerary to discuss and request change before tickets were issued. You just have to be your own advocate. The immigration hall at Lisbon airport was very crowded when we arrived at 6:30am and it took us over an hour to go through immigration. Several Viking reps were there to greet us and we boarded a large bus to the cruise terminal at Cais Jardim Do Tabaco, which is immediately south of the Alfama neighborhood. We finally checked in and were welcomed aboard the ship at 10am. Guests had the opportunity to enjoy snacks/beverages/lunch and relax. We decided to stay put until we could check into our cabin, drop our carry-on bags and then go sight-seeing in downtown Lisbon. We visited Lisbon in 2009 with Grand Circle Travel, so we had seen Lisbon's major attractions including those in Belém. The day's plan was to check out some of the areas of central downtown that we did not get to see the last time and we accomplished this via taxis and tuk-tuk. Our ship left Lisbon at 11pm by sailing west on the Tagus River to the Atlantic Ocean. As we looked out at the street lights and building lights from our room on the right hand side of the ship, we knew that our ship would sail past the Belém Tower, the Monument to the Discovers, and the Monastery of Jerónimos, but due to the darkness we could not visually identify these landmarks. Here is a link to some Lisbon photos from our 2009 trip. The ship crossed 5 time zones from Lisbon to Miami, so there were 5 days when we gained one extra hour by turning the clocks 1-hour back. We used the Thermal Pool with water jet on Deck 1. The changing rooms had showers, lockers, robes, towels, slippers and even a machine to dry your wet bathing suit. There was an attendant to assist if you had questions. The spa area also had sauna, steam room and a cold Nordic Snow Grotto, all free of charge to guests. Each guest floor had a self-serve launderette with 4 washers, 4 dryers and 2 irons and iron boards. The laundry rooms were open 24/7 and the machines were free of charge, which was very convenient. 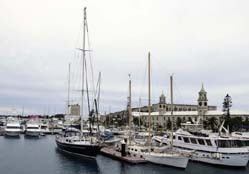 Viking SUN sailed into Bermuda at 8am, we docked at the capital city, Hamilton, till 3:45pm. Viking provided each guest a complimentary excursion called "Bermuda on Your Own" which was an all-day transportation pass to explore the island on our own via bus or ferry. The air in the city of Hamilton had a distinct smell due to its high humidity. We walked to the City Hall, then to the city library. Hamilton felt very commercialized with its endless number of stores. We took a ferry to the Royal Navy Dockyard for nostalgia reasons. We met some passengers on the ship who were on their very first ocean cruise. They were happy customers of Viking River cruises, therefore took a leap of faith and signed up for a Viking Ocean cruise. Were they happy with this cruise so far? They sure were. The ocean ship's cuisine was much more extensive and the public spaces were enormous compared to a river ship's. On the last evening, the production singers presented a performance of "The Music of ABBA" celebrating the hit songs of ABBA - Dancing Queen, Fernando, Take A Chance On Me, I Have A Dream, Mamma Mia! etc. The beats and rhythm were very cheerful and brought the ending of the cruise on a high note. Luggage needed to be placed outside the cabin by 10pm, or one may roll their own luggage off the ship the next morning. 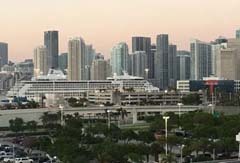 MC got up at 5am and went to the Explorers' lounge to watch Viking SUN sailing into Miami port. The water channel was narrow with sky scrapers straight ahead, a highway to our right and a causeway lined with palm trees to our left. The ship had to sail further toward land to a wider area to make a 180 degree spin turn to dock at the terminal. We took our time to tie up loose ends then went to the buffet to enjoy breakfast one last time. We left on a shuttle bus chartered by Viking to Miami International Airport. At mid-day, Miami was sunny and 79F while we knew our home in Reading MA was only 39F, very cold. Our AA flight left Miami at 12:50pm. With a free excursion at every port, plus well-priced ship's optional excursion for purchase means you do not have to organize your own independent excursion if you are happy with what are being offered. Free WIFI of reasonable speed and connectivity throughout the whole ship and guests were not limited to how many devices they want to connect. Newer ship, very clean windows. Pool deck had retractable roof, so that guests could continue to use the area on rainy or cold days. Sushi, sashimi and king crab legs served at every dinner on the buffet. At Logan airport, the TAP Portugal agent charged us $180 for two check-in bags. We were surprised that Viking purchased such bare-bone international air tickets with 0 check-in bags for its customers, so we fired a grievance email to Viking's air department attaching a picture of our $180 payment receipt. Viking agreed to reimburse us. They promised a check within 14 business days, but it actually took about a month. We were still very glad to have received it.